Decision comes almost two years after DOT's first public presentation. 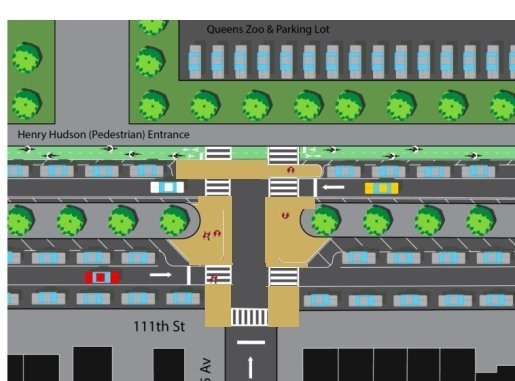 Mayor de Blasio gave the go-ahead to DOT’s plan for a road diet, wider pedestrian medians, and a two-way protected bike lanes on 111th Street in Corona. The mayor made the announcement last night at a neighborhood town hall in response to a question from Vero Ramirez of Mujeres en Movimiento. “That’s a final decision,” he added later. Mujeres en Movimiento and other local advocates have been campaigning for years to create safer access to Flushing Meadows Corona Park, which is cut off from the neighborhood by the treacherous five-lane configuration of 111th Street. But the DOT plan to narrow the roadway and shorten crossing distances ran into resistance from Assembly Member Francisco Moya and Queens Community Board 4, especially board member James Lisa, a Moya donor who lives on 111th Street. The city eventually watered down the project to appease Lisa and Moya, and it now includes two southbound traffic lanes instead of one while providing no marked crosswalks. The city is moving forward with the weaker design. Trottenberg said the city would “absolutely” evaluate that design after implementation and could decide to add elements of the original plan further down the line. “In the spirit of compromise, everybody gave a little bit,” she said. Lisa didn’t hold up his end of the bargain at CB 4, however. De Blasio’s announcement came eight days after CB 4 tabled the weaker version of the redesign. The city will be spending the political capital of proceeding without the board’s stamp of approval, but won’t be getting the full safety benefits of the initial plan. DOT says installation will begin by the summer. Ah yes, the spirit of compromise. A driver does not want the hint of a perception of travel delay. I don’t want to get killed by a driver. Let’s compromise. The right thing to do is to install the original plan with crosswalks so people on foot can get to a PARK (!) safely on foot. If I were the mayor, I wouldn’t pat myself on the back for an act of courage here after this thing dragged on for so long. As for Trottenberg’s comments, “Everyone gave a little bit” means that some people will give their lives. Tough situation for Trottenberg & DeBlasio. They are honest public servants. They negotiated a compromise with Moya, who I guess no longer opposes the (revised) proposal. The City feels they have to live up to the agreement they made. The problem is that while Moya has stuck with the deal, Lisa & CB4 still oppose it, and will clearly NEVER stop trying to kill it, by any means they can come up with. So the City feels obligated to stick with the inferior compromise deal, so as to stay true to their deal with Moya. That’s understandable & respectable. The problem, obviously, is that we need those crosswalks, with either stop signs or traffic lights. Without them, people–probably kids–are gonna get hurt or killed. Kids are forever running & biking across 111th St, especially at 46th Ave, where there’s a heavily used playground right across 111th St from FMCPark. So, explain this: How the hell do we have here an Assemblyman whose great contribution to this community negotiation is eliminating crosswalks that are going to save our kids’ lives? How is that even possible? Thank God for Council Members Dromm & Ferreras-Copeland. And we should also all thank DOT, Trottenberg & DeBlasio for sticking with this & doing the right thing. Even if they don’t want to put up stop signs or traffic lights (and I frankly agree here because NYC has about 10,000 too many signalized intersections as it is), why not at least put in marked crosswalks with yield signs? At least drivers get the idea that people are crossing here. That said, my primary aversion to more traffic signals is because they’re detrimental to cyclists. However, that design looks like you can put up a yield to pedestrians sign in the bike lane while having any traffic signals apply only to the motor lanes, just as is the case with the PPW bike lane. Not sure if that was in the original plan but it removes the excuse for not putting in traffic signals on account of cyclists. I was so excited to be there last night! This was the version I suggested a year ago or so. This doesn’t remove any parking. Get a grip. 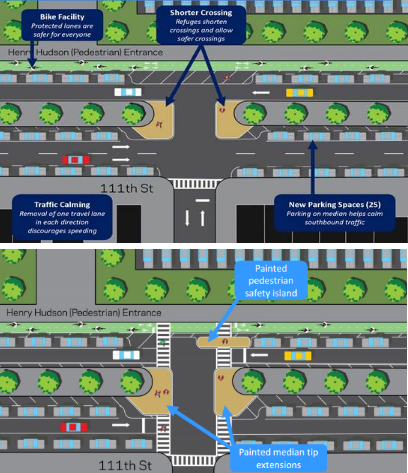 If DOT is going to implement a safer design of 111th Street in Corona, it won't be thanks to the local community board. With DOT crews wrapping up work on the 111th Street project, local residents went for a celebratory ride last week. Streetfilms' Clarence Eckerson was there and put together this video tour of the redesigned street and retrospective of the three-year advocacy campaign to make this project happen.